Get your party started right! 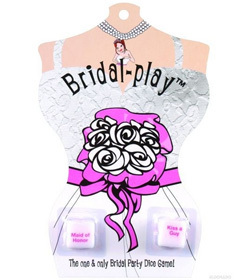 The Bridal-Play Dice Game is for the bride-to-be's last night out single. Roll the dice and find out which one of your bridal party will be performing which dare. The one and only bridal party dice game! Frequent Lover members earn 8 loyalty points on this product! *For security purposes, What is the smallest number?